Though I wrote about this event on Sunday I had not uploaded photos yet. They are now online, not many but another rider asked to see them so here they are. A possible new pink bike? After a few years of being keen to get to them, I finally made it along to the SS national championships this weekend, helped by the fact they were held in Majura Pines in Canberra. 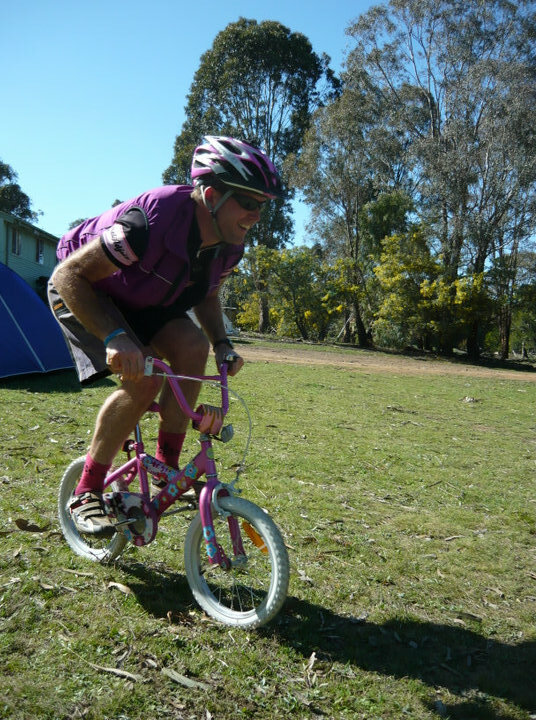 Canberra One Gear Society (COGS) hosted the event and 120 or so riders rocked up for a fun weekend. My SS is not pink (though my race bike is) I wonder if I should get an upgrade, maybe to something similar to the bike pictured? The Hill climb and Time Trial were fun yesterday, then the novelty events were held, the photo was taken by Rob during the 16 inch crit races, which were in fact a race down a hill trying to stay upright on small bikes, possibly the most fun on a bike all weekend trying to balance on them had us all giggling a lot. The traditional (well traditional for an SS race) XC race was on today. The beer shortcut cut around three and a half minutes off my lap time, so after doing the long lap the first time round to work that out I took the beer shortcut every lap after that. Five laps, 4 beers, around 21m per lap I think, though I may be a bit off with that as my gps stopped when drinking, still it was a fun race. I am looking forward even more to the world SS championships in Rotorua in October now, it should be a lot of fun. I guess I will not be upgrading to the specific bike pictured as it was later used in the huffy/barbie bike toss event on Saturday afternoon. Looking at the BoM Canberra forecast today it only just twigged that this is now displayed and rather amusing. I know they are upgrading their information on these pages currently and I am not sure if this is just something showing up for a little while, however is it for people who can not do simple addition and subtraction or is there a chance of some other percentage?